Live, from Peoria, Illinois, it’s Saturday Night Cheeseburger, starring this week’s host, Agatucci’s and featuring the Ready For Prime Beef player, Marty Wombacher. Ladies and gentlemen, please welcome this week’s host all the way from University Street...Agatucci’s! One thing I love about blogging is you’re constantly meeting new and interesting people. When I was doing the 365 Bar Crawl, one of my stops when I came back here to visit was Khaki Jack’s. I asked to take a photo of a fellow at the bar and he happily complied. I asked him his name and he told me: “Tony Agatucci.” Immediately I asked, “From Agatucci’s restaurant?” And Tony laughed, because he probably gets that all the time, because Agatucci’s is one of Peoria’s oldest, iconic restaurants. Well, a week ago I had dinner at Agatucci’s and saw Tony at the bar and went up and said hi and told him I had moved back. We had a nice conversation and I found out that in addition to serving up the best pizza in Peoria, they also have cheeseburgers on the menu, so I told him I’d be coming back to try the cheeseburger out. And now here we are heading there, see how this works? And here we are at Agatucci's. A familiar restaurant for anyone who's lived in Peoria. It's Saturday night, so the place is crowded, but there's some seats at the bar, let's go snag one. And no sooner do I sit down, than I'm greeted by the co-owners of Agatucci's, Tony and Dan Agatucci. They're the fourth generation owners, this place has been in the same location since 1926. Both Tony and Dan worked here in their youth. Dan told me his first day working day here happened when he was five-years-old. They were short on dishwashers, so they called him in. He said it was fun for the first twenty minutes and then reality set in! This shot of two of the taps shows that Agatucci's is a Cardinal bar, you Cub's fans have been warned! There's a couple of sets of comfortable, padded booths directly behind the bar. 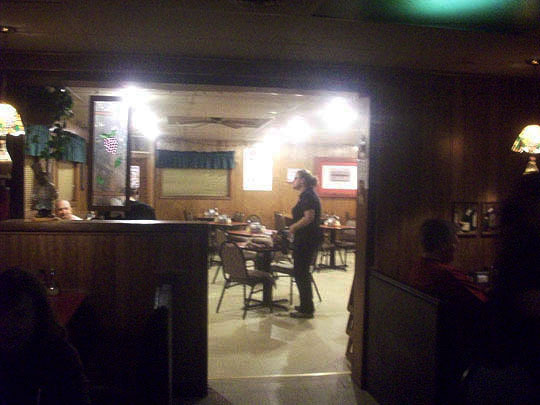 Here's the dining room that's located behind the bar. It's Saturday night and it's packed in here. Lamps made from Italian wine bottles hang suspended from the ceiling over the booths that line the walls. Tom and Becky! They were enjoying dinner at this booth and happily posed for the MBIP camera. Tom told me a guy working behind the bar is dating his daughter and he's here to keep an eye on him. We'll see if we can find this guy when we return to to the bar. And there's yet another dining area in the back. Tony told me this room was added on in 1988. Okay, this is more like it! Here's Sam, one of the pretty and friendly waitresses at Agatucci's. Added her name. Happy birthday, Kate! The napkins and condiments have been set up, looks like it's almost cheeseburger time! And here it is, nothing fancy, just a good old fashioned cheeseburger with pickles on the side. It's a tasty burger and the bun is bakery fresh, which is key to me. I'm glad it's not a huge burger, because I also ordered a small cheese pizza. You can't come in to Agatucci's and not eat some of their legendary pizza, that's just the rules! Tony brought me a bottle of their signature pizza sauce, "Tiger Sauce." He told me that the story behind the sauce. It seems in the '60's, Geno Fulgenzi, a regular at the restaurant would pour the leftover salad dressing on his pizza, so they decided to bottle it up and put it out as a pizza topping. The name, "Tiger Sauce," happened because the first bottles they bought for the sauce had pictures of tigers on them. 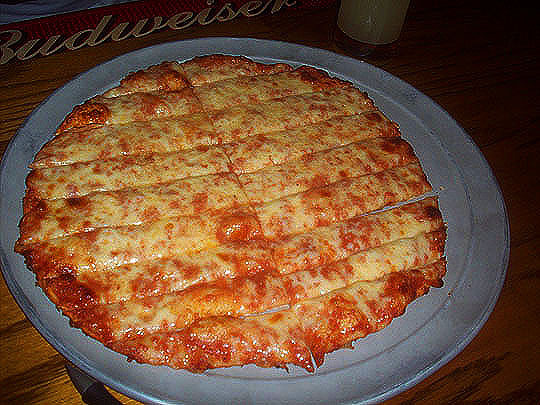 And here's what Agatucci's is known for, the best pizza in town! And yes, I ate the whole pie, it was delicious! 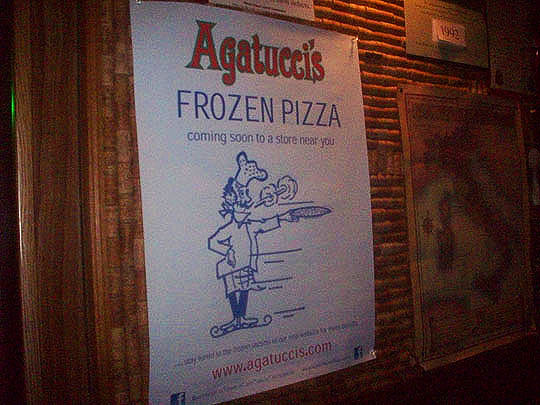 Look out, Butch's, Agatucci's has frozen pizza coming out soon! Hey, this town is big enough for two local frozen pizzas. We'll have to do a dueling taste test when Agatucci's hits the stores and the bars. 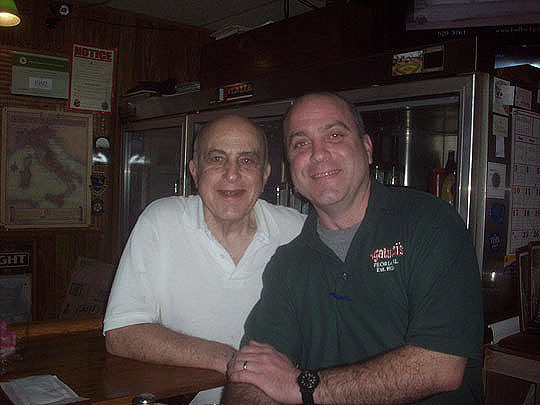 Here's Tony behind the bar with his dad, Jim. Third and fourth generation Agatucci's owners. Here's Jim telling a great story from days gone by in Agatucci's. Stop by and ask him to tell you the "half of a pizza" story, it's a classic! 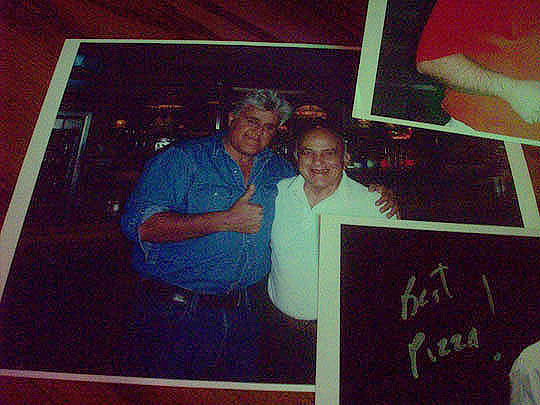 When the Renaissance Coliseum at Bradley opened up, Jay Leno was brought in to do the opening festivities. Before he flew back to L.A. that night he asked someone where the best pizza was in town, because he wanted a pie for his flight back home and someone told him to go to Agatucci's. 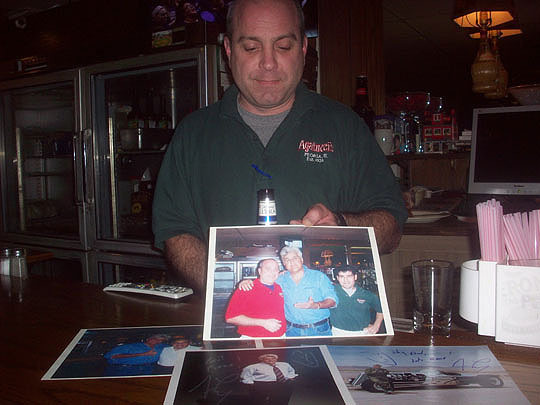 Here's Tony with some photos of Jay's stop at the restaurant. Here's Jay with Tony and Dan behind the bar. Jim pointed out the clock on the wall and told me it's been hanging there since 1955. And it wasn't really 11:00, it was 10:00, but they had already set it ahead for daylight saving time. I decided to hit the road and thanked the Agatucci's for a fun Saturday Night Cheeseburger evening. See you all tomorrow! It’s funny, Tony was almost apologetic about the cheeseburger when I ordered it, but it was very good. Nothing special, just a good old fashioned cheeseburger, with melted American cheese on a bakery fresh bun. Not the greatest burger I’ve ever had, but certainly not the worst either. What is the best in Agatucci’s is their pizza! I’d rank it the best in town and unlike another unnamed Italian restaurant in town *cough* Avanti’s *cough* you don’t have to go through “Corporate” to take photos in there (yes, I’m still obsessing over that). The bar area is one of the friendliest and fun places in town. 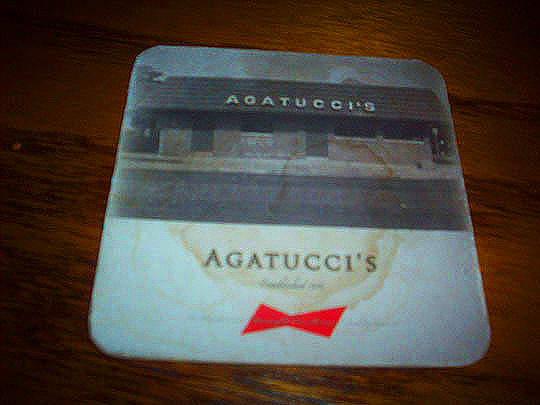 If you’re like me and haven’t been there in a while, stop by and join in on the good times and great food at Agatucci’s! Two and a half Wimpy’s. The burger makes for a nice appetizer for the real treat in here, their pizza pie! 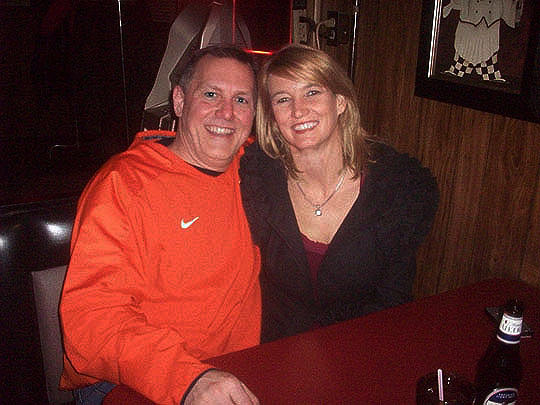 Further reading: Peoria Journal Star (this is a great story! ), You Gotta Eat and facecrack. Now it's hey Mambo, Mambo Italiano! To put up a picture of the guy who's dating Tom's daughter. His name is Mike and don't worry Tom, he seems like a great guy.